Be the first to share your favorite memory, photo or story of Eathel. This memorial page is dedicated for family, friends and future generations to celebrate the life of their loved one. Eathel Pollock Medlin Hales, 82, passed away Friday morning at the Wilson Pines surrounded by her loving family. 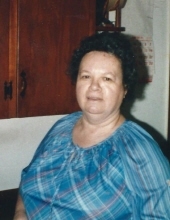 Eathel was born in Johnston County on April 23, 1936 to the late Lonnie W. and Junnie Mae Edwards Pollock. She was a member of the New Jerusalem Free Will Baptist Church. The family will receive friends on Tuesday, December 11, 2018 from 1:00 p.m. until 2:00 p.m. at New Jerusalem Free Will Baptist Church. A service to celebrate her life will be held at 2:00 p.m. in the sanctuary with the Rev. Jasper Renfrow officiating. Burial will follow in the church cemetery. Eathel is survived by her daughter, Cathy Medlin of Kenly; son, David Medlin and wife Becky of Lucama; sisters, Ethel Mitchell, Phyllis Rose, and Jeanette Morgan; brother, Eddie Pollock; 4 grandchildren; 11 great grandchildren; and one great great grandson. In addition to her parents, she was preceded in death by her sister Rose Scott; brother Joseph Pollock; and grandson Tommy Price. To send flowers or a remembrance gift to the family of Eathel Pollock Hales, please visit our Tribute Store. "Email Address" would like to share the life celebration of Eathel Pollock Hales. Click on the "link" to go to share a favorite memory or leave a condolence message for the family.